Copyright Questions are discussed here. All rights are reserved by the authors and/or publishers. These broadcasts are for free educational purposes only. We encourage viewers to purchase the books we are studying. 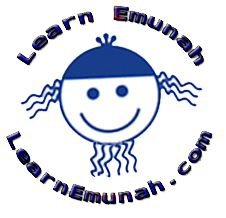 All of the LearnEmunah.com broadcasts are now produced on YouTube and available on my new Learn Emunah channel for viewing later. PLEASE subscribe to this channel! With 100 subscribers we will be eligible for a custom url that is easier to remember. Note, the 1God7Laws broadcasts are in transition. For these one must join our Facebook group. "The Best of Sholom Aleichem"
This book collects two dozen of the great Yiddish writer's cleverest, funniest, and most profound and touching stories, half of which are newly translated, and provides an introductory commentary on Aleichem's achievement, Sholom Aleichem is the author of the beloved "Fiddler on the Roof." Translated by Rabbi Aryeh Kaplan. Why Do We Assist "Noahides? "Noahides" are non-Jews who voluntarily choose to embrace the Torah as prescribed by the teachings of Moshe Rabeinu, the Rambam, and our other Jewish sages. Torah is very clear that Jews are to be the "nation of priests" (Exodus 19:6). The Noahides are our G-d decreed "laity." Likewise: "And He [HaShem] said, "It is too light for you to be My servant, to establish the tribes of Jacob and to bring back the besieged of Israel, but I will make you a light of nations, so that My salvation shall be until the end of the earth" (Isaiah 49:6). "Influencing non-Jews to keep their mitzvos, the Seven Noahide Laws… will assist our task of making the world into a dwelling place for God, and help bring about the arrival of Messiah." For those who judge me harshly for assisting the Noahidim, here is my support for this important work. For those of you who wish to walk the Noahide Way, you have friends here at LearnEmunah.com! Are Online Shabbat Services Permitted Under Halacha? The way we do them, yes. We follow the same accepted guidelines as Shabbat stoves (or blech), Shabbat elevators, lighting, heat, etc. Our equipment is set up with timers before Shabbat and are not turned off until after havdalah. Jews wishing to join us are encouraged to have their computers on with the correct page selected. When the times comes the broadcast will automatically begin. Leave your comupters on until Havdala and there are not halachic concerns. We discourging using your comupter for anything during Shabbat. An Interview With Penina Taylor by Rabbi Shlomo Nachman On You Tube. Rabbi Aryel Nachman ben Chaim and Shlomo share unique Torah consistent insighs into the Seven Universal Laws that makes these ancient legal codes as relevant to our modern times as ever before. A unique Torah based introduction into the Way of the Seven Universal Laws. Rebbe Aryel Nachman and Rabbi Shlomo Nachman share their insights into this incredible revelation Rebbe Nachman of Breslov. (Most of the LearnEmunah.com pages include video presentations. I invite you to connect with me on My Facebook or visit my contact page, for other options. Your questions, comments, and corrections are always invited and appreciated.